Thank YOU for taking the time to visit our Baby registry! 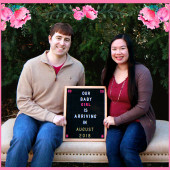 We are beyond excited to grow our family and for our baby girl to arrive this Summer! We chose this site to use as a general location for our registered items. You can choose to purchase from this registry online, or visit on site at Buy Buy Baby and Target locations. We have provided links for the stores below. Melissa, Kyle & future baby!